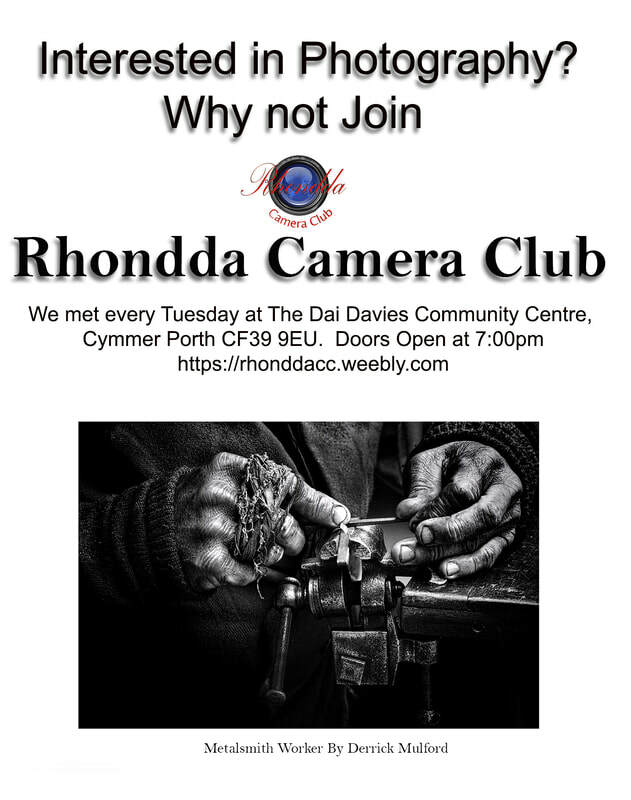 ​The Rhondda Camera Club was founded 1943 and aims to encourage and promote the art of photography by means of lectures, workshops field trips and exhibitions. Members are encouraged to enter their photography in Club Competitions and friendly Battles with other Camera Clubs. Special digital evenings are arranged throughout the club year, using the Club’s own equipment. All levels of experience are welcome at the Club, from beginners to most experienced, friendly support and skilled advice is available to all newcomers. Club Night Doors open at 7:00 pm for a 7:30 pm start. This Thursday the 5th April is a 6 club battle with Pyle & Porthcawl club at St. Claire’s School CF36 5NR, 7.30 pm start. Anyone wishing to attend please email Dawn so car sharing can be arranged. Next Tuesday the 9th April we have a highly recommended speaker visiting our club. Graham Harries show is Chernobyl and it’s Environs. A night not to be missed! Non members £3 entry. 3 prints and or 3 DPI's All work for this competition must have been entered in one of our monthly competitions this season only and not been altered in any way from it's previous entry. To be handed in by May 7th (Points accumulated during this competition will not go towards the final club competition scores. Stand Alone Competition (Prints Only)show is Chernobyl and it’s Environs. A night not to be missed! Non members £3 entry. 3. Images from previous competitions can be used. 4. The scores will not be added to the monthly competitions as the season would have ended in May and you cannot have images that have already been scored in previous club competitions. This will take place at the end of June 2019. New images are encouraged. change to program on 23rd April from 'Members Night' to 'Mathew Jones - My Journey'. The selection dates are the 23rd & 24th March 2019 at Talbot Green Community Centre & our selectors are Vince Penticost, Mike Cullis & Paul Keene. The Salon Exhibition will be held at the Cynon Valley Museum Aberdare in late spring Dates to be announced later. Full details on www.thewpf.co.uk website. Members are reminded that images that have been used in previous club "monthly" competitions cannot be submitted and any future club "monthly" competitions and that your images can be retained by the selection committee for external battles/ competitions. If you have any images that you would like the selection committee to consider please bring them along and place them in the appropriate box. Without your images we cannot participate. 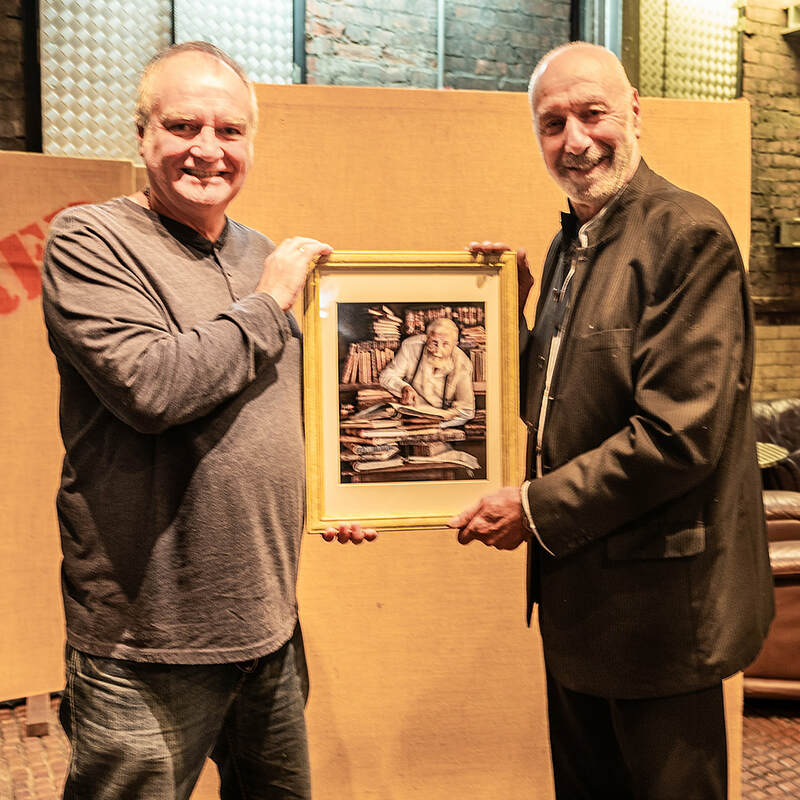 ​with his prize of a print of his choice from our recent exhibition at 'The Factory'..